Without a doubt, the task of selecting the perfect bow is daunting for most beginners. With all the different choices and types of arrow available on the market, beginners start tripping on questions like which type of bow to pick and what would be their perfect draw weight. Once they finally manage to wade through those worries and finally settle on a perfect bow, they now have to contend with the choices of buying accessories. Is a bow-stringer necessary? Can I save money by not buying this specific accessory or is it really important? Finally, when that hurdle has been crossed, the beginners sigh in relaxation and just pick up an arrow lying next to them and strut off to a shooting range. However, this final decision gives them a kick in the teeth and makes them realize that they have just overlooked the most important and difficult of all choices. That’s when they realize that arrow is not just as good as the next one. In fact, choosing your arrows might be the most difficult choice you have to make when you start off with archery training. The length of the arrow compared to your bow, the grain/inch of the arrow and the spine specifications – all of them play a major role in determining how well it suits with your bow. Apart from the bow’s suitability, factors like the terrain, weather, and suitability for your purpose need to be taken into account when buying your arrow. In this guide, we’ll take a look at different types of arrow and how they could affect your archery experience. Obviously, we’re not going to talk about obsidian arrowheads with serrated edges or crude arrow shafts made from animal bones. We are also not going to mention obscure, hybrid arrows nor any specific brands. Instead, we’re going to discuss about the major arrow types and their specific uses. From here, you can determine which one would be the most perfect for you. Among the various options available for the average consumers, there are some products tailored to specific purposes. There are also those that come in seperate parts that are customizable for those struggling to find the perfect match for their purposes. It’s the tip of the arrow, typically made of metals like stainless steel, iron or aluminum. They come in different shapes and types for different purposes. Although they’re typically reusable, they are the first ones to get damaged for the obvious reason – they take the brunt of the impact. Like all the other parts of an arrow, the arrowhead influences the range, velocity and the flight pattern of the arrow as well as it’s penetration and damage dealing ability. It’s the main backbone of the arrow. Usually, an archer is supposed to take the length of the arrow shaft into account when purchasing one. You wouldn’t want to use short arrows with bows that have long draw lengths. An experienced archer would also take special note about the shaft’s weight in grains, as well as its spine in order to measure the stiffness. Not only do they affect the flight patterns of the arrows but also their durability. The fins or vanes are attached to the end of an arrow in order to make it more aerodynamic, add spin and stabilize the flight path. These can be made with feather or plastic, depending on the user preferences. Feather fletchings are usually used indoors because they’ve very little water resistance. Plastic fletchings, however, can be used in all weather conditions at the expense of a little accuracy. An experienced archer can easily offset this little inaccuracy when hunting in the wild. An arrow can come with three or four fletchings depending on the user needs. Usually, 4-fletched arrows allow for a smaller spread and greater accuracy at the cost of projectile velocity and range when compared to the 3-fletched ones. A nock is an etched end on an arrow, used to correctly attach the arrow to a bowstring. A nock can be snappable external one, a gluable external nock, or the end of an arrow filed to have an etching in it. The smallest type of smooth arrowhead with a sharp tip. It provides a high velocity, higher penetration and a more stable flight. It lags behind a little in terms of dealing damage, but is still preferred by most hunters. It’s commonly used for archery target practices. These arrowheads are just as small as bullet points with a sharp tip though there’s a wider/tapered step on the bottom. This reduces its penetrative capabilities without sacrificing the velocity and balance. They are mostly used for target practice, making the arrow much easier to retrieve due to its lower piercing abilities. These arrows are wide and have sharp, knife-like blades. These are aimed to increase the damage dealt and make the target bleed. Almost exclusively used for hunting, these arrowheads are difficult to pull out and retrieve. The wider arrowhead receives more drag and resistances from air, making the flight pattern unstable. Therefore, it’s always a good idea to use broadhead arrows with lower spine shafts (more information is given below) to increase the accuracy and reduce sway and shot groupings. Also known as Grabbing Points, these arrows have a wider tip and some gripping ‘arms’ on the sides. This allows the arrow to fall upright if the archer misses the target. It makes the job of finding and retrieving the arrow a lot easier at the cost of penetration and damage. As the name suggests, these arrowheads come with a blunt tip, sometimes even made of rubber. They’re designed to inflict blunt force trauma to the target and are preferred for small game hunting. This way, the targets could be hunted without damaging too much of their bodies. They are sometimes preferred for practice shooting, usually as a hobby and in the backyard, to reduce the risk of accidental injuries. There are other custom arrowheads, crafted for different purposes, such as incendiary and explosive arrows. We’re not going too deep into their territory since they tend to be more specialized and illegal in most states. Then there are arrowheads like the fishing points, more suited for bowfishing purposes. But we believe that the average user will be satisfied with sticking to the types mentioned above. The importance of the length can never be understated. It’s absolutely essential for an archer to ensure that the length of an arrow can accommodate the draw length of the bow the archer is using. It also affects its total weight for the same grain/inch value, decreasing the projectile velocity and range. Spine is the measurement of how flexible an arrow is. The higher the spine rating, the more flexible the arrow. A flexible arrow can help the arrow adjust its course mid-flight aside from providing a greater flexibility in eliminating the archer’s paradox. However, a more flexible arrow tends to be less accurate with wider arrowheads since the air resistance can make the arrow change its course during the flight. Always consult a spine rating chart to find the one most suited to your needs. The material an arrow shaft is made of can affect its durability, flexibility, weight and cost. 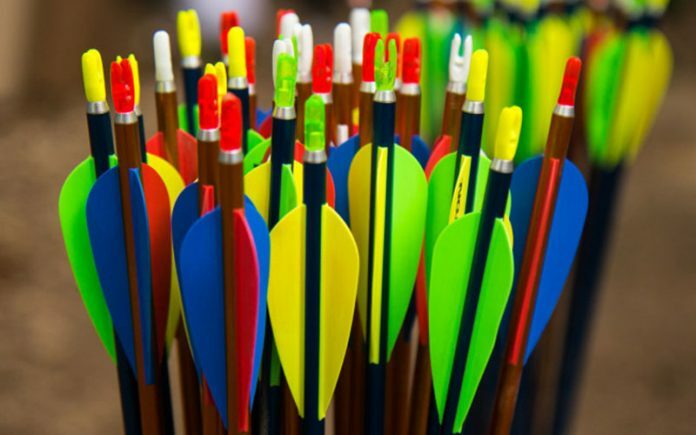 The modern-day arrows are usually made with Aluminum, Fiberglass, Carbon Fiber or wood. Fiberglass arrows are cheap and often bought in bulk. Although they tend to be of the lowest quality, the low cost makes them an excellent choice during hunting or backyard shooting due to their expendable nature. However, they are less accurate than the other types on the list. Aluminum shafts are hardy, heavy and they usually come at lower spine ratings. With a balance between price, quality and durability, these shafts are often reasonable choice for multipurpose use. Although these shafts are hollowed out to reduce the weight, the material, being heavier, still reduces the flight speed of the arrow. Wooden Arrows are usually used with traditional bows, such as longbows, Mongolian bows and recurve bows. They are relatively inexpensive and they come at a variety of weights, spines and sizes. However, they are mostly non-customizable. They are still preferred by some hardened hunters and practitioners due to their “vintage” novelty and they still make good starting arrows for the beginners of longbow archery. Carbon Fiber Arrows are the most expensive on the list and are of the highest quality. Usually preferred for sports archery, they come in a hybrid form as well as with a pure carbon fiber build. Hybrid arrows use a combination of lightweight metal alloy with a carbon fiber weaving as a coating to reinforce the body. Pure carbon fiber arrows are also available on the market that are lightweight, durable, fast and come in a variety of sizes and spines. With their high accuracy and build quality, they are excellent for hunting as well, but being so expensive, they might not be a reasonable choice for the hardened bow hunters. When looking for fletchings, the choices are significantly easier when compared to the other options on the list. Fletchings come in different makes and shapes, but all leads to making the arrow more aerodynamic and accurate. Feather fletchings are usually made of bird feathers, such as Turkeys and are clipped into shape for maximum control. They are sometimes colored differently to ensure the accurate alignment of arrows on a bow. Apart from that, colored fletchings can also help the archer distinguish their own arrows from the others’ in competitive environments. Feather arrows tend to be less water-resistant, getting heavier when wet, making it a bad choice when hunting in the rain. They are also more susceptible to damage and are usually not used with some types of compound bows. Plastic fletchings, on the other hand, are water resistant and durable, and they are getting more and more popular every day. However, they tend to be a little less aerodynamic when compared to feather fletchings. But the best thing about plastic fletchings is that they can be tailored into different shapes and sizes as required, which isn’t possible with feather fletchings. One such mentionable shape is the helical fletching, designed to increase the spin of the arrow; thus increasing the accuracy and flight speed. However, they are more susceptible to damage and deterioration than the straight designs. As we’ve seen and established, all the factors come into play when choosing an arrow. Unfortunately, there is no “one-size-fits-all” solution when it comes to choosing your arrow and it’s absolutely essential that the archer takes all these issues into consideration when shopping for it. The type of arrowhead, the build of the spine and the fletchings used are all interconnected with each other. So, the next time you’re going out shopping for arrows, make sure to consider all these factors to find out which combination of these parts would be best for you. If you’re a backyard archer, stay frosty. If you’re a sporty one, game on. And if you’re a hunter, happy hunting. How to Be a Pro at Installing and Reading Fishfinders?